Bank of India had invited Applications for BOI SO EXAM 2015 provided on the official website and successfully completed the process of filling ONLINE applications till 22nd December 2014 for 33 vacant posts of Specialist Officers (SO). These posts of Specialist Officers in the specialist field of industrial Relation, investigation, Technical Appraisal and statistician for Grade I, II and III. BOI is going to release Admit Card for the ONLINE written test of BOI SO Exam 2015 which is going to be tentatively conducted on 22nd January 2015. Those candidates who have applied for the post and waiting for admit cards can download their admit card on the direct link provided in the end of the post. · Click on the link say Career on the official website. · Click on the link say Admit Cards for Specialist Officers (SO) Exam 2015. The BOI SO Exam will be conducted on 22nd January 2015. The BOI SO EXAM 2015 will be conducted by ONLINE MODE. In ONLINE Mode, the exam will be entertained through filling of circles on Computer Generated Page containing information of answers which will be selected by filling circle in it. There is no OMR sheet will be filled by Blue/Black ball point pen. A rough blank sheet will be issued for calculations/rough work in exam. This rough sheet must be submitted to the duty officer in the end of the exam. The exam will be conducted an objective multiple choice question paper of 200 questions of 200 marks to be done within 2 hours or 120 minutes. The exam consists of four sections contains questions of English, Reasoning, Quantitative Aptitude and Professional Knowledge.. The exam will be a multiple choice question paper in which five options are provided out of which candidates need to choose one correct answer. For more information candidate must download syllabus and exam pattern of BOI SO EXAM from the official website. Exam will be conducted on the scheduled time mentioned in BOI SO Admit cards of the candidates. The Official Answer keys may be discussed on the official website of BOI SO Exam 2015. A total of 20 marks out of 50 marks is required to qualify reasoning sections, 10 marks out of 25 marks is required to qualify English Section, 20 marks out of 50 marks is required to qualify Quantitative Aptitude Section and 30 marks out of 75 marks is required to qualify English Section. 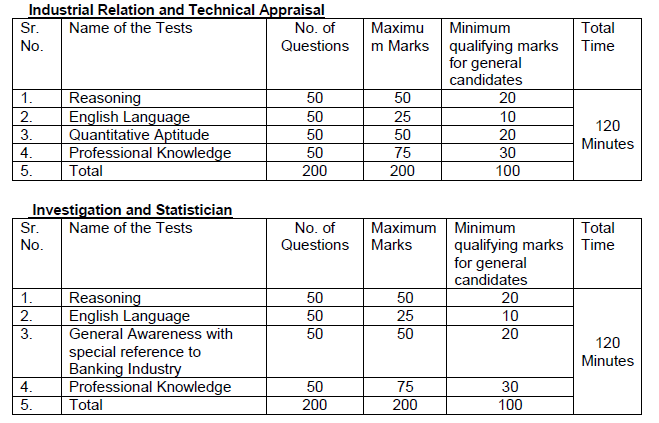 The 100 marks will be required to qualify for BOI SO Exam 2015. Those candidates who get qualified in ONLINE Examination of BOI SO Exam 2015 will be called for Group Discussion. The date, time and venue of group discussion will be mentioned on the interview letter of the candidates. The interview and group discussion will be conducted on the various centres allotted by Bank of India. The total marks allotted for Interview/Group Discussion will be 100. General Category candidates will have to score 40% in interview/ Group discussion where as OBC/SC/ST candidates will have to score 35% in interview/ Group discussion round to qualify this stage of exam. There will be document verification along with interview of the candidates.